EasyDose now has the added feature and power of allowing a Pharmacist to Log in to EasyDose, unlock the screen or even verify entries at the stroke of a finger. This will negate the need to manually log in using a name and password or change these details where another user is logged in. EasyDose will simply and quickly identify the user, select the user and identify them making EasyDose the quickest and most versatile system of its type. It will also negate the need to change passwords every two months and will provide an added level of security. Further to that is the fact that Patients will be able to identify themselves, before dosing, allowing EasyDose to open the appropriate dosing forms speeding up the process even further while again adding an extra level of security when dosing. It will replace the need for a patient to sign for their dose, where required. EasyDose will operate with either one or two fingerprint readers, where two will allow individual use between pharmacists and patients. Therefore not sharing a reader. 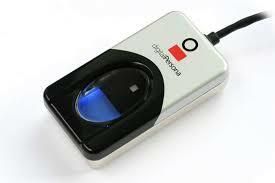 The only Fingerprint Reader which EasyDose is designed for is the U.Are.U 4500. No other reader will work with EasyDose. The installation of the Fingerprint Reader is detailed on a separate page. Click here to view the Instructions. EasyDose do not sell or on-sell this product. Aquion Pty Ltd are one of the distributors of this product inside of Australia.